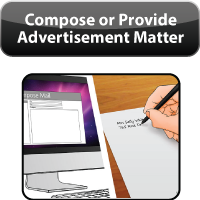 A government notice ad is generally issued in larger public interest. There are various reasons for which the government may need to publish a public notice ad in newspapers. It is most often to make the public aware of some new legislation/law that has been recently enacted/passed. It can also be for Recruitments in government jobs. It can also be a notice to attract certain contractual jobs with the government, where in a notice is tendered in an open market to attract bidders. A notice is placed in the form of an advertisement by the government to pass on the information on a larger scale. This is the basic intent and purpose. There are times when a govt issues notices to certain entities on legal grounds. This is when a norm or a rule is flouted. Hence this can be a show cause notice, and at times be a legal notice. It all depends on the matter. However these will not make it as an advertisement. Rather these are personal communications, because it is sent to individuals or entities on matters that are entirely different. A public notice ad by govt for procurement (purchase) will be like invitation of tenders. Here, parties will have to quote their cost towards the material that wish to supply to the government. Why do you think is the govt placing an ad to purchase these things? Why can't it just go about purchasing it? Well! In a democracy, everything has to be transparent. The govt invites tenders and bids indorder to show to its people that the purchase or contract awarded, has been for the best quality and at the same time, cost effective. Yet we wonder why should they be informing the public through an advertisement? This is because it is the public money that is being utilized for the public. Recruitments to govt jobs (like that of, in railways or police etc) are advertised in the leading newspapers in the state. These vacancies are advertised by govt agencies. The govt also has a responsibility to be fair and competent in recruiting for the vacancies. It has to follow the rules and regulations (a standard procedure) set. The Govt also puts up advertisements in newspapers in the form of notice. These notices are what we call as tenders. For example ads for redevelopment of public properties like bridges, parks and also Govt residential colonies etc. Govt. 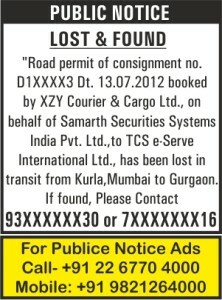 notice ads can be booked in any of the newspapers across the country through us. 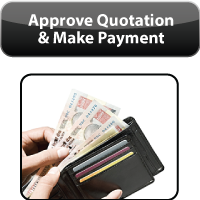 We have compatible, affordable rate cards for Mumbai region newspapers and others across the country. We don't charge for creating the ad sample for you. Do contact our customer care team on +91 22 6770 4000 / 67706500 / 9821254000 or email us on info@riyoadvertising.com. We will be glad to assist you. This is Public notice ad by the Government of India, Finance ministry. It addresses the concerned persons and states that a complaint has been received from a person. It further makes it clear about a hearing that will be taking place in the tribunal on a particular date (as mentioned in the ad) .This is a notice of summon, which is also seen as a public notice ad. As per the notice, the concerned persons can appear in person or through his lawyer and submit a reply in this regard.